In today’s modern world, the way we do business is quickly changing. Gone are the days when you have to go into the office to get tasks done. Now, you can just log onto your computer, sign into the office remotely, and get some work done. But just because you have the ability to work remotely, should you? And more importantly, should you extend this benefit to your employees? The answer to those questions is a big, resounding YES. Not only will your employees benefit from the ability to work remotely, but your business will too. Here’s why. By allowing employees to work remotely, you are giving them more flexibility with their lives outside of work. When their child is sick, your employee no longer has to take the day off. Instead, they can work remotely and take care of their child, losing only a little productivity as opposed to an entire day. Additionally, when your employees are sick, they no longer have to drag their illness into the office with them, possibly infecting everyone else. Instead, they can stay home with their coughs, fevers, and sniffles, and still get a bit of work done if they are able. Working remotely allows employees to handle the little curve balls of life, without drastically impacting their work responsibilities. Additionally, empowering employees with ways to manage both their personal and professional demands goes a long way towards boosting employee morale. 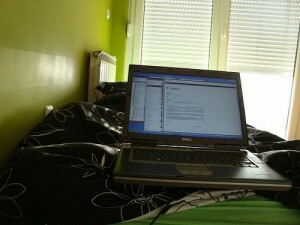 Having ways for employees to work remotely means that even when your physical office is down, work can still get done. This is especially true if you are using one of our BDR devices which allows you to access your server from the cloud, in as little as five minutes in the event of a disaster or emergency. What’s more, allowing remote access to the office allows you to expand the number of staff on hand without having to find extra space in the office to physically put them. This translates into less money spent on space, power, or any other expenses incurred to maintain your physical office. If you don’t allow your employees remote access to the office, what’s stopping you? Don’t let the worry of cost or security keep you from utilizing a service which can make your office more productive, and your employees happier. Instead, contact us today to see how we can make remote access a reality for your office. Julie Strier is a freelance writer who likes to help you make sense of your business needs. Email: julie@mybusinesswriter.com. Website:www.mybusinesswriter.com.